This is what I made myself for breakfast today – I really couldn’t face another sausage patty. I don’t like to drink smoothies too much – not only is there no chewing involved which has been shown to improve digestion, there is a fair amount of sugar and not much protein. This smoothie is dairy-free and AIP friendly. The spinach adds to the nutritional value (although raw spinach contains high levels of oxalates, another reason not to indulge in these on a daily basis). The beet kvass provides some gut-healing probiotics, but if you don’t have any, or don’t like the idea of beets in your smoothie you could substitute another fermented drink such as kombucha or water kefir. You could also use fruit juice in it’s place as well. I also added some gelatin for more gut-healing and to provide a small amount of protein. 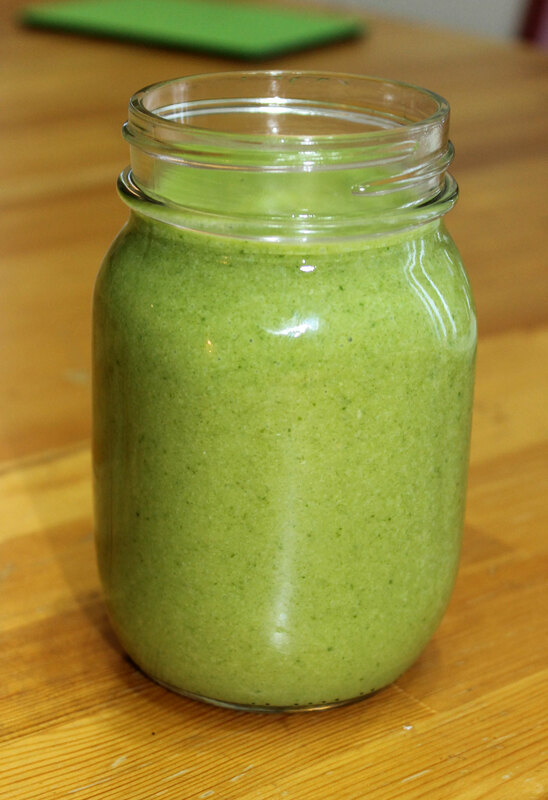 Don’t worry about adding spinach to a smoothie, you really don’t taste it. All you taste is the flavour of the fruit. All you do is to put all the ingredients in your blender and blend on a high setting for a minute or two until everything is combined. Pour it into 2 glasses and consume. This entry was posted in Autoimmune Protocol Foods, Recipes and tagged AIP-friendly, Autoimmune Protocol, breakfast, dairy-free, green smoothie, paleo, primal. Bookmark the permalink.